All estimates are free and flexible according to schedule availability. Clear View Exteriors LLC is fully dedicated to providing the highest quality workmanship, the most advanced roofing, window and siding technology, and the smartest solutions for all types of residential roofing systems. With the added impact resistance, this traditional three-tab shingle offers a level of protection that’s far from every day. When it comes to weathering the elements, XT 25 is quite simply at the top of its class. Built on a tough fiber glass base, each shingle provides exceptional resistance to blow-off and tearing and has a 10-year StreakFighter warranty. If you are looking for a shingle with staying power, your search stops here. When it comes to weathering the elements, XT 25 is at the top of its class. Built on a super tough fiber glass base, XT 25 provides excellent durability and performance. Presidential TL Solaris has the rustic authenticity of our Presidential shingles with the added strength of triple laminate construction. All colors are rated by Cool Roof Rating Council (CRRC) and meet California’s Title 24 requirements for cool steep slope roofing. Presidential Solaris is a steep-slope, solar reflective asphalt roofing shingle which contains advanced colored granules that reflect the sun’s rays. Designed to replicate the look of authentic wood shakes, Presidential Solaris shingles feature 25 percent solar reflectivity and deliver the charm of hand-split wood shakes with durability and strength that outperforms wood. With maximum definition colors, a new dimension is added to the shingles with a richer mixture of surface granules. You get a brighter, more vibrant, more dramatic appearance and depth of color. Presidential Solaris solar reflective shingles help reduce energy costs and meet the California Cool Roof Rating Council guidelines. Presidential Solaris is a solar reflective asphalt roofing shingle designed to replicate the look of authentic wood shakes, delivering the charm of hand-split wood shakes with durability and strength that out performs wood. Presidential Solaris’ innovative technology produces a shingle that reflects solar energy in a traditional color palette. With its unique sculptured tabs, Presidential Solaris provides distinct styling, depth and dimension of wood shakes.All colors are rated by Cool Roof Rating Council (CRRC) and meets California’s Title 24 requirements for cool steep slope roofing. 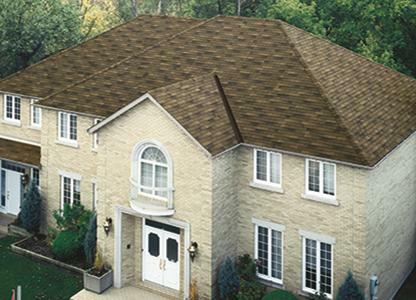 Presidential Shake IR’s sculpted edges and staggered design combine to give your roof the charm and beauty of authentic wood shakes. Presidential Shake, made of two laminated layers of the industry’s most durable materials, was the first of its kind. No other shingle replicates the look of real wood shakes quite so stunningly. The added tougher fiberglass base to help achieve the highest impact resistant rating from U.L. This shingle has been tested to withstand the impact of a 2 inch steel ball being dropped from 20 feet in the air. In some areas, insurance companies offer homeowner discounts if you install an impact-resistant shingle. The industry’s first ‘architectural-style strip, Patriot is a single-layered asphalt shingle that uses CertainTeed’s advanced color technology to mimic the depth of multi-layered architectural shingles. Plus, with a 30 year warranty against manufacturing defects, you can stand tall knowing that Patriot is a smart and affordable roofing choice. CertainTeed’s NorthGate SBS modified asphalt shingle is unmatched by other standard asphalt shingles. The rubberizing aspect of SBS allows greater flexibility so the shingles resist cracking even in extreme cold-weather, allowing for year round application. SBS also offers superior granule adhesion which is one of the key components in protecting the shingle against the elements. Three laminated layers of the industry’s most durable materials, providing a dramatically thick roofing product styled with the classic appeal of wood shakes. Landmark TL is the triple performance shake that has the hand-split look of cedar and the durable dimension of tri-laminate technology. Landmark Solaris PLATINUM from CertainTeed Roofing is a brilliant energy-saving breakthrough that puts cool roof technology to work. Landmark Solaris is a steep-slope, solar reflective asphalt roofing shingle which contains advanced colored granules that can reflect solar energy and radiate heat far better than traditional roofing shingles, reducing your roof’s temperature in the summer. Landmark Solaris Gold from CertainTeed Roofing is a brilliant energy-saving breakthrough that puts cool roof technology to work. Landmark Solaris is a steep-slope, solar reflective asphalt roofing shingle which contains advanced colored granules that reflect solar energy and radiate heat far better than traditional roofing shingles, reducing your roof’s temperature in the summer. Landmark Solaris Solar Reflective Shingles are ecologically smart, beautifully durable, and architecturally ideal for sunny climates or anywhere solar heat is a challenge. Landmark Solaris is a steep-slope, solar reflective asphalt roofing shingle with advanced roofing granules that reflect solar energy and radiate heat far better than traditional roofing shingles, reducing your roof’s temperature in the summer. Rated by the Cool Roofing Rating Council (CRRC) for cool roofs and meets the California Title 24 requirements for cool steep slope roofing Solaris shingles may qualify for credits/points in LEED, NAHB and other GREN programs. And, our palette of rich, authentic colors makes Landmark Solaris an easy choice for eco-friendly living. The innovative technology of Landmark PRO Solaris produces a shingle that reflects solar energy in a maximum definition color palette with rich hues and stunning dimensionality. All colors are rated by Cool Roof Rating Council (CRRC) for cool roofs and meet California’s Title 24 requirements for cool steep slope roofing. Landmark PRO Solaris shingles are manufactured using the same high standards as all CertainTeed roofing products and are covered by the same superior warranty protection. This product also features CertainTeed’s NailTrak that offers a wider nailing area. Engineered to outperform ordinary roofing in every category, Landmark PRO boasts the rich hues and stunning dimensional of CertainTeed’s Max Def color technology. Good looks aside, this dimensional laminate shingle is built to last, with two layers of high-quality roofing asphalt and an industry leading lifetime limited transferable warranty. When you choose Landmark Premium, you make the decision that assures the beauty, durability and security of your home for generations. Landmark Premium is engineered to outperform ordinary roofing in every category, keeping you comfortable, your home protected, and your peace-of-mind intact for years to come with a transferable warranty that’s a leader in the industry. With Max Def colors, a new dimension is added to shingles with a richer mixture of surface granules. You get a brighter, more vibrant, more dramatic appearance and depth of color. And the natural beauty of your roof shines through. This shingle has a tough fiber glass reinforced base to help achieve the highest impact resistant rating from UL. Tested to withstand the impact of a 2 inch steel ball being dropped from 20 feet in the air. 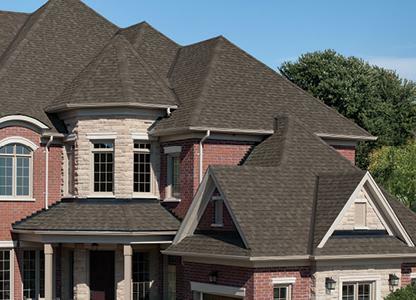 With soft shadow lines, a random tab design and a patented color blending process, Landmark IR gives your roof the classic shades and dimensional appearance of natural roofing materials. Landmark is CertainTeed’s tried-and-true architectural laminate roofing shingle. Designed to replicate the appearance of cedar shake roofing, Landmark is available in an impressive array of colors that compliment any trim, stucco or siding. Beautiful laminated, randomly placed tabs are woven to display a one-of-a-kind design. 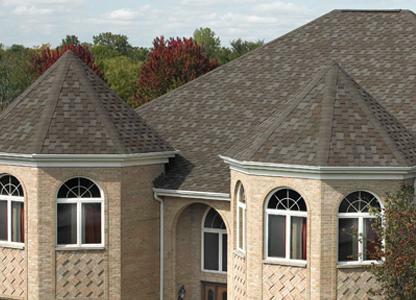 The smooth surface and the random tabs combine to give the classic roofing style. A full-size base shingle for maximum coverage and ease of roofing installation, saving you on labor installation charges. Random laminated tabs for added depth, a look that will provide curb appeal for your home, from any angle. CertainTeed’s Highland Slate has the look, texture and tone of natural slate with a dark shadow line to accentuate its appeal from the curb. Each tab is individually colored by state of the art Precision Color technology to provide a rich, deep, hue and its four-across tab is the ideal design to deliver color, contrast, and perfection when installed. Wind, rain, snow, ice this slate-like shingle performs at its best when the weather is at its worst. Highland Slate is rated where the winds howl 110 mph and it carries a full wind-resistance warranty. Some roofs say more about you; about your style; about the home that uniquely showcases your life. Grand Manor says it all with a style and grace that is exceptional from every angle. The best of the best, an ideal choice for homes with great steep sloped roofs. From the sweep of a Victorian frame to the symmetry of a Colonial gable, the preservation of timeless architecture accented by steeply pitched roofs is a hallmark of the Carriage House luxury shingle. Carriage House has been painstakingly designed to evoke the unique hand-crafted look. Equal measures of craftsmanship and architectural creativity are at play in this shingle. With cut-away corners and wide, dark shadow lines, Carriage House creates a one-of-a-kind look of scalloped-edge natural slate…the perfect roofline for your home. Add the level of protection provided by Carriage House’s super heavyweight construction makes for a perfect pitch. The beauty of Belmont, with the enhanced strength of UL certified Class IV impact resistance. Made from top grade roofing asphalt and reinforced with a strong fiber glass base mat, this shingle is engineered to stand up to unforgiving elements. Its layered construction and blended coloration includes rich hues and high contract shadow lines which artfully emulate the classic look of slate roofing. Plus it comes backed by CertainTeed’s lifetime-limited manufacturer warranty, for the additional peace of mind that today’s homeowners expect and deserve. When it comes to replicating the authentic appearance of natural slate, Belmont truly hits the mark. This luxury shingle’s layered construction and blended coloration – which includes rich hues and high contrast shadow lines – artfully emulate the classic slate roof look. Made from top grade roofing asphalt that is reinforced with a strong fiber glass base mat, Belmont is built to endure, and comes backed by a lifetime-limited manufacturer warranty. Welcome to the new standard in premium architectural roofing: Arcadia Shake from CertainTeed. Arcadia Shake is inspired by the iconic appearance of split wood shake, with each shingle formed from a high-grade blend of roofing asphalt, proven to outperform traditional shake roofing in virtually every environment. Unlike natural wood, Arcadia Shake is maintenance-free and provides a superior class of fire and wind resistance. A fraction of the cost of wood shake, Arcadia Shake offers discerning homeowners an artisan look at a price that makes it the smart choice for protecting and beautifying their home.